A Myobrace is a functional appliance that retrains the muscles of the lips and tongue. It is worn for an hour a day as well as all night during sleep. This is done in combination with various exercises to help retrain the muscle patterns of the tongue and lips, which are ultimately responsible for the position of the teeth. Another unique aspect of treatment is the incorporation of the “Breathing Retraining Programme”. Not only does breathing play an important role in the development of your child’s jaw – it also offers a world of health benefits that go beyond straight teeth! Overall this gives a more holistic and less invasive approach to orthodontic treatment. The goal is to create room for all of the teeth to come into alignment, not to extract them! What’s the difference between BRACES & Myobrace Therapy? Traditional orthodontic methods wait until the child is in their teen years to extract crowded teeth and then align with braces. This can interfere with normal cranial development as well as create an unfavourable facial profile. Because these methods do not address the “underlying cause” the real problem remains untreated and eventually the teeth move back (this is called relapse). Therefore patients need to wear ‘retainers’ for life to hold the teeth in position. Extractions are irreversible and can be avoided. Our treatment options include correcting the underlying cause of crooked teeth as well as improving tooth alignment, arch development and jaw relationship. The goal is to create room for ALL of the teeth ‐ not to extract them! Myobrace Therapy works by retraining muscle patterns, correcting oral habits and establishing nasal breathing. The ultimate goal is to obtain long term results, minimise relapse and improve the patients overall health. Myobrace Therapy is available for children of all ages, teens and even adults although the best time for treatment is while the child is still growing as they have more cranial growth remaining to promote good arch and facial development. Oral habits such as breathing through the mouth and swallowing incorrectly are the major causes of crooked teeth and underdeveloped jaws in children. Our Practice provides treatment options that correct the underlying cause of crooked teeth as well as improving tooth alignment, arch development and jaw relationship – without the need for braces or extractions! This is called Myobrace Therapy. Four Patterns for straight teeth! Every child has the genetic potential to grow straight teeth! The Myobrace was designed by the Myofunctional Research Company (MRC) and has been widely adopted throughout the world. Similar in appearance to a mouth guard – this flexible appliance is worn at night while sleeping and for one hour per day. Treatment is usually required for a period of 24 months and needs to be monitored by an experienced Myobrace practitioner as part of a programme for a successful outcome. The Myobrace comes in a range of different sizes and stages. Each Myobrace has various features to help retrain the muscle patterns of the tongue, lips and cheeks. The tongue tag trains the tongue to rest in the roof of the mouth where it is needed to develop and maintain the jaw to its correct size & shape. The Lip bumper trains the lower lip to stop pushing back on the teeth each time the child swallows. Tooth channels provide light tooth alignment properties to help guide better arch form. The Myobrace encourages proper jaw positioning to improve jaw relationship. The “bulky” Myobrace helps to improve lip seal by making it challenging for the patient to hold their lips together. As the muscle fibres in the lips begin to strengthen it becomes easier to achieve a lip seal with and without the Myobrace (It’s like exercise for your lips!). When the Myobrace is worn the patient is encouraged to breathe through their nose (not the mouth!) which is the normal, healthy breathing pattern for humans. Extractions: Our approach is to create room for all the teeth ‐ not to extract them! This allows the tongue to fit comfortably in the roof of the mouth. Extractions make a narrow jaw even smaller, restricting space for the tongue to fit in the palate. If the tongue cannot fit in the roof of the mouth – it cannot provide the support needed to sustain the shape of the upper arch. Therefore the treatment outcome will be less stable and this will increase the patients’ risk of relapse after treatment.Extractions are irreversible and we do not encourage their use for orthodontic purposes – alternative options are available! Braces: They’re great for aligning teeth quickly – but they won’t keep your teeth straight! Braces consist of an arch wire attached to brackets on each tooth which mechanically pull the teeth into alignment. When the braces are removed the patient is fitted with retainers (either a wire that is glued behind the teeth or a plastic casing of the teeth that is worn over the top). The retainers are worn to prevent the teeth from moving back into a crooked position. In most cases the retainers must be worn for life or the patient must accept that their teeth will move back. This is because braces do not address the underlying cause of crooked teeth in the first place. The position of the teeth is determined by the muscle patterns of the lip and tongue. Oral habits such as swallowing incorrectly, mouth breathing and poor lip seal contribute to incorrect jaw development and tooth alignment. These habits must be corrected and the muscle patterns need to improve in order for the teeth to remain in a stable position and stay straight – which is exactly what Myobrace Therapy aims to achieve! What age can children start treatment? Our practice provides treatment for children and adults of all ages. The ideal age for treatment is between 5-9 years old. Patients treated earlier on as children (while they still have cranial growth remaining) can achieve great results as this optimises arch and facial development. Results are still achievable for teenagers with good compliance but the process may take longer due to limited cranial growth. In some but not all cases – braces may still be required if treatment is left too late or if the pattern is quite severe. Some children can start treatment from as young as 4 years old if parents see fit. Although we can identify habits and patterns in children under the age of 4 years, it is often more difficult to establish good patient compliance below this age group. Click here to find out more about treatment options for ADULTS. After your child has completed the three step consultation process we can fit the Myobrace and commence the first phase of treatment. Treatment plans are for 24 months in duration and begin by establishing a good routine of Myobrace wear (wearing the Myobrace for an hour a day and all night during sleep). This is normally achieved in the first month. The children visit the practice every four weeks to report on progress and learn their new Myobrace activities with our team of Myobrace Educators. Dr John Flutter or Dr Asad Jamil will see the children at each visit and discuss the changes in the muscle patterns, tooth & jaw position. After approximately 3-4 months of good Myobrace wear – we can progress to the next stage of treatment which often involves arch expansion. When the jaw is too small we need to make room to accommodate all the teeth so that they are not crowded. This can take 4-6 months depending on which of the following appliances are used. The Biobloc stage 1 (also known as the “plate”) is used for children in the early to mixed dentition (children with all or mostly baby teeth). It is a removable appliance but it needs to be worn all the time (except for when brushing the teeth & plate). The plate is used for a total of 6 months. The Child uses a special key to turn the tiny gear that expands the plate, once per day for some of that time. When the children are turning their plates – we see them every two weeks to ensure the correct amount of turns has been made (usually a max of 6 visits). Once they have finished turning, visits return to four weekly. During this phase the Myobrace can be adjusted and worn over the top of the plate for one hour during the day – but no night wear is required. The Bent Wire System (or “BWS” for short) is used for children in the mixed to late dentition (children with a mix of baby & adult teeth; or with only adult teeth present). It involves a wire that runs behind the teeth and is fixed into two metal bands on the molar teeth at the back. The Dentist can take it out for adjustment but the children cannot. The wire is used for approx. four months and is adjusted once every four weeks. The best thing about the BWS is that the Myobrace can be worn over the top for both day time and night time wear. After the arch expansion phase is complete, the next stage of Myobrace appliances is fitted and the Myobrace Therapy programme continues with four weekly visits. It is particularly important to maintain good Myobrace compliance at this stage to ensure that the newly developed upper arch does not relapse! We need to train the tongue to rest in the roof of the mouth to support the new arch shape and size. In order for this to happen – children must have their lips together and be breathing through their nose (not their mouth). It can be challenging for some children to re-establish nasal breathing and so now is the ideal time to undertake the Breathing Retraining Programme. The programmes are run every school holidays and involve 4 x 1 hour sessions at the practice to learn the exercises and theory behind it all. This is followed by 90 days of breathing exercises which will take 15 minutes a day. This is how long it takes to change breathing patterns. During that time we will continue to see the children every four weeks for their regular Myobrace appointment and to check their breathing rate/progress on the Capno Trainer (the latest in biofeedback technology!). Breathing Retraining offers a world of other health benefits that go beyond straight teeth! Find out more about the Negative Effects of Mouth Breathing here. At the end of the 24 months a final set of records is taken (photos and impressions of the teeth) for the “Case Review” appointment. At this appointment Dr John Flutter will display the records from the start to the end of treatment to show the progress made and discuss the overall treatment outcome. The following oral habits can interfere with normal jaw development resulting in crooked teeth. Traditionally most of these cases would be treated with braces and possibly extractions – however the oral habits would remain untreated. This increases the chance of relapse as the oral habits are given the opportunity to move the teeth all over again. At Fortitude Valley Dentist we not only avoid the use of braces and extractions when treating crooked teeth – but we aim to correct the oral habits that caused them in the first place! Learn how these habits can influence the position of the teeth and find out about our treatment approach for each. No two children will have the same muscle patterns. No two children have the same crooked teeth. By looking closely at these patterns it is possible to accurately predict which teeth will be crooked and by how much. 1) Is your child a mouth breather or nose breather? If your child mostly breathes through their mouth, the tongue will not be resting in the roof of the mouth where it is needed for normal arch development. This will lead to a small upper jaw that is set back in the cranium (skull). Every time! When the jaw is small and underdeveloped – there will be insufficient room for all the teeth to come into good alignment. As a result the teeth will appear crooked. A child that breathes through their mouth will often have an anterior open bite. That is: When their back teeth are bitten together – they can push the tongue out between the upper front teeth. This is because the tongue pushes or thrusts forwards on every swallow. Treatment often involves arch expansion (using a plate) to return the jaw to the ideal size. In addition, the Breathing Retraining programme is essential to ensure that the mouth breathing habit does not continue – or the jaw will soon relapse (return to where it started). The Myobrace is used to train the tongue to rest in the roof of the mouth to support the new arch development. Our Myobrace educators will work with the children to correct their swallowing and tongue thrust habits. 2) Are the lips together at rest? If the lips are apart at rest then the tongue is unlikely to rest or function in the palate. 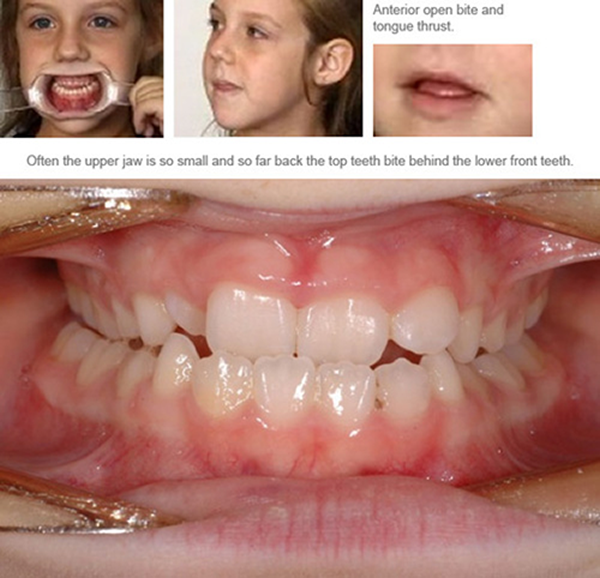 You will see a narrow upper jaw and crooked upper front teeth. Treatment often involves arch expansion (using either a plate or a wire) to make the narrow jaw wider and resolve the overcrowding. The Myobrace is used to improve lip seal by retraining the muscles of the lips and making them stronger. The Myobrace trains the tongue to rest in the roof of the mouth to maintain the size of the upper jaw. Myobrace Therapy also involves a series of lip and tongue exercises to promote better lip seal and correct tongue posture. 3) Are the muscles in your child’s chin being used in order to bring the lips together? Ask your child to bring the lips together. Place your finger gently on the chin. If you feel the chin hard under your finger the chin muscles are being used. These muscles only work when your child thinks about it. If these muscles are being used your child will have the lips apart all the time. The picture below demonstrates muscles in the chin being used to bring the lips lightly together. This is because the muscle fibres of the lip are too weak to hold the lips together. This is known as “incompetent lips”. The child will have their lips apart all or most of the time. When the lips are apart the tongue will not be resting in the roof of the mouth and this will encourage a mouth breathing habit – both will result in poor jaw development. When the Myobrace is worn for an hour during the day it requires effort of the patient’s part to hold the lips together (just like exercise). This strengthens the muscle fibres of the lips and makes it easier for the child to maintain proper lip seal. Gradually it becomes easier for the child to hold their lips together and the muscle effort in the chin will reduce as the lips become stronger. Eventually there should be no muscle effort in the chin and this will mean that the child has achieved “competent lips”. Various lip exercises are used in conjunction to accelerate lip strength. When the lips are together the tongue can rest in the palate where it is needed for good arch development to occur. 4) Do the lips move when your child swallows when not eating or drinking? There should be no movement of the lips when your child is swallowing, when not eating or drinking. Light forces are needed to move teeth. The muscles of the lip and tongue apply forces of up to 500 grams. All movement of the lips while swallowing will push the teeth out of a straight line. 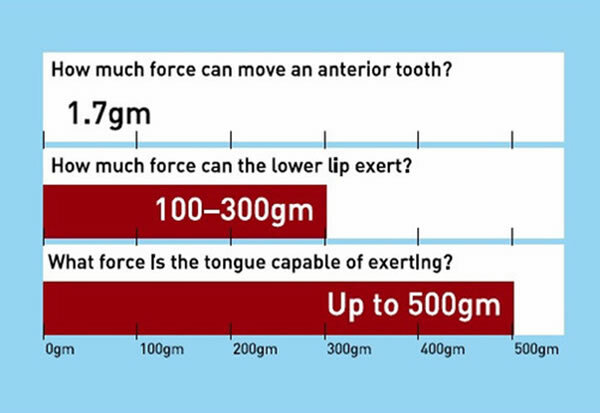 Small forces move teeth – the lips and tongue push hard! Myobrace Therapy aims to correct poor swallowing patterns! 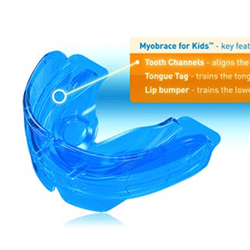 The lip bumper on the Myobrace discourages the lower lip from pushing back on the teeth each time the child swallows. The children are taught a combination of drinking and swallowing exercises to practice each day in order to learn how to swallow correctly. This ensures that the teeth will not be pushed around by the lips. 5) Does the lower lip rest on or behind the upper front teeth? If the lower lip rests behind the upper front teeth, then it will be sucked into the mouth to make contact with the tongue on swallowing. Everybody swallows about 2000 times a day. The more the lower lip is sucked in behind the upper front teeth, the more the top front teeth will protrude or be in front of the bottom front teeth. 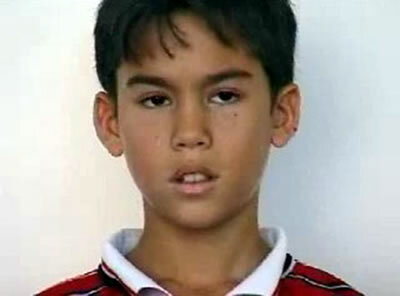 This is the cause of “buck teeth”. When the Myobrace is worn the lips cannot be sucked behind the top front teeth and a normal swallowing pattern is encouraged. Myobrace activities are provided to improve lip seal and swallowing patterns. The Myobrace promotes ideal jaw relationship and provides light tooth alignment properties to correct protruding buck teeth. At Fortitude Valley Dentist we offer Children’s Breathing Retraining Programmes for all children in treatment. This is because we know that the development of the jaws and position on the teeth is greatly influenced by a child’s breathing habits. For a stable treatment outcome – we need to ensure that a normal, healthy breathing pattern is restored.But did you know that correcting a mouth breathing habit and re-establishing nasal breathing can offer a world of other health benefits that go beyond straight teeth? Below are just some of the negative health effects of “Mouth breathing” that can be reduced. Children who have a “mouth breathing habit” will get sick more frequently as this by-passes your body’s main air filtration system – The nose! The nose is like an air-conditioner – it filters & humidifies the air we breathe, providing our lungs with clean, warm air. When we breathe through our mouth – our lungs are supplied with dirty, cold, dry air. This drags large volumes of untreated air directly into the sensitive lung passages. This air contains viral and bacterial matter and we can be more susceptible to coughs, colds and chest infections. Mouth breathing is directly related to the majority of upper respiratory tract infections especially, ear, nose and throat, inflamed adenoids and sinuses. The nasal and sinus cavities are designed for heavy duty air filtration and humidification – leaving the tonsils to do only the finer filtration jobs. When you breathe through your mouth – the tonsils are confronted with untreated air, are expected to do the heavy duty work and eventually become inflamed, swollen or infected. As a result – many people have their tonsils & adenoids removed. This could easily be prevented by simply establishing nasal breathing. Parents will notice that a child who breathes through their mouth at night – may snore and wake up tired in the morning. Every single cell needs a regular and uninterrupted supply of oxygen in order to function and regenerate. If we are short of oxygen or if we don’t get enough oxygen released to our cells – we feel tired, listless and have no energy. As a result cells die; we have poor quality of sleep and disturbed sleeping patterns. Another common result of a mouth breathing habit in young children is bedwetting. But how is this related? Tubes are hollow organs surrounded by bands of smooth muscle. Mouth breathing lowers levels of CO2 in the blood – Low CO2 causes smooth muscle tubes to go into spasm and interfere with most body functions. Bedwetting often occurs when the smooth muscles of the bladder go into spasm, contracting and emptying its contents during sleep. Lack of oxygen and low CO2 levels can cause poor concentration and behaviour. Recent studies indicate that children who snore or have other night-time breathing conditions are at risk of developing behavioural problems. Researchers state that sleep problems could be harming the developing brain resulting in severe day-time tiredness in Adults and attention-deficit hyperactivity disorder (ADHD) in children. Breathing issues could cause behavioural problems by reducing oxygen supply to the brain, interrupting the “restorative processes” of sleep or disrupting the chemical brain balance. Occasionally these symptoms can lead to misdiagnoses of ADHD as parents don’t make the connection or mention breathing issues to their GP.